The apple company made their first notch smartphone as iPhone X last year. Since many smartphone company made nothed display smartphone. But today I'm gonna talk about such a phone that you have not seen before. I m going to talk about Sharp Aquos R2. This Japanese company made their new phone with double nothed display. 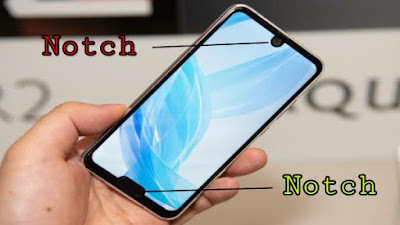 According to the company the company says that It is the first smartphone in the world with 2 Nothed display. 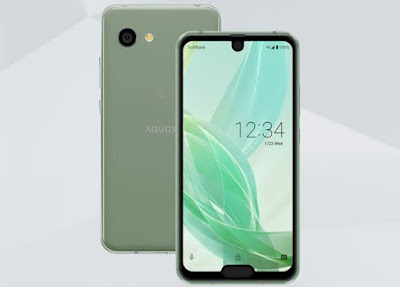 At the Aquos R2 , waterdrop notch is given up top ,in which the front camera is available of 8 Megapixel camera. At the buttom there is a fringerprint sensor. The phone comes with 4GB of RAM and packs 64 GB of internal storage which can be expandable upto 512 GB via microSD card. Also it has powered by 3180 mAh li-ion non removable battery . As per the camera the phone supports dual camera at the rear. 22.6 MP and 16.3 MP cameras respectively with autofocus. At the front there is a camera with 8 megapixel featured with face detection, Geo tagging , panorama , fouch to focus etc. • The phone doesn't have FM Radio. • As per the weight the phone is 181 gm heavy. • Biggest problem is that it has a hybrid SIM slot.